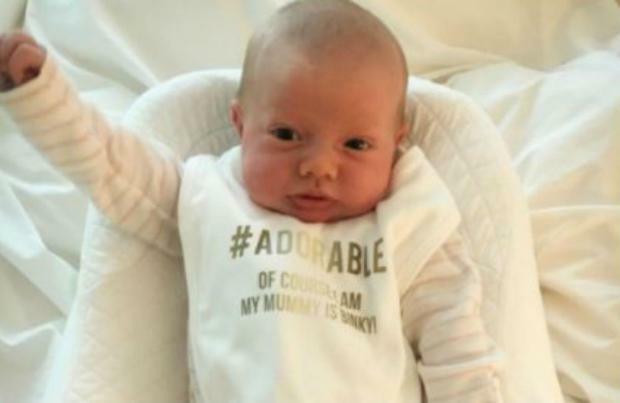 Binky Felstead has shared an adorable picture of her newborn daughter India. The 27-year-old reality TV star took to Instagram on Tuesday (11.07.17) to post a snap of the tot, who she welcomed with boyfriend Josh 'JP' Patterson last month, wearing a bib with the words "Adorable- of course I am my mummy is Binky". She wrote: "Apologies I can't find who sent this but I #adore it!!!! 'Adorable- of course I am my mummy is Binky' #hellyes !! Haha (sic)." Josh recently revealed that India - who weighed 7lb 13oz when she was born just before 2pm on June 12 in the Lindo Wing of St Mary's Hospital in Paddington- has brought the pair closer together. Josh said: "Having India has cemented us - even more than we were before. We're a family now." The former 'Made in Chelsea' stars had an on/off romance until the brunette beauty discovered she was pregnant last year, and they eventually got back together but were still taking things slowly. However, now they are parents to India, JP has moved into Binky's house because he can't bear to be apart from his new family. JP said: "We've very much not had a conventional relationship but organically we've got to a point where I want to be here day and night to be with Binks and India." And the 27-year-old hunk admitted he loves Binky even more now after being by her side when she gave birth. He added: "When you've seen your partner give birth, you end up feeling emotions for them that you've never felt before. "I can't describe how much admiration I have for Binky for what she's been through. "I love her so much for that. It's a new feeling in my heart. Having India has cemented us, even more than we were before."